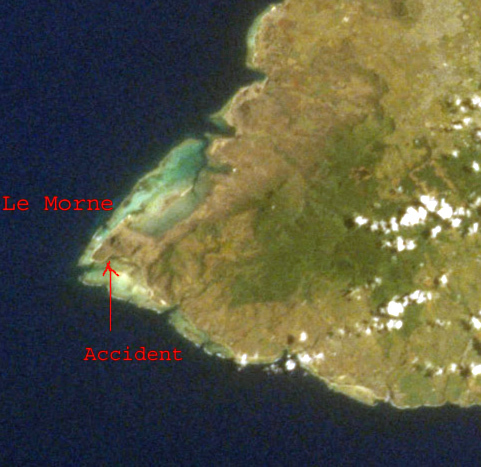 Two tourists were staying at hotel on the southern coast east of Le Morne, Mauritius. 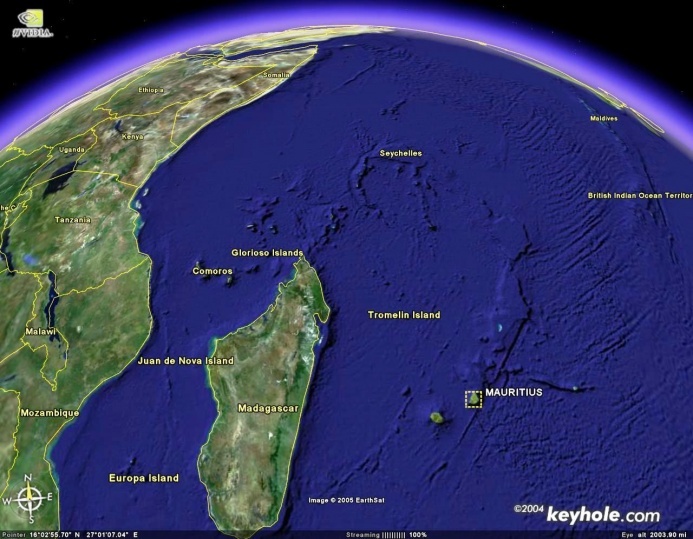 Mauritius is located to the east of Madagascar off the southeastern coast of Africa in the Indian Ocean. One of the tourists who had recent purchased kite gear, the "student", but had no experience approached the other tourist for lessons. The second man agrees to give the "student" instruction but without any reported qualifications to teach. 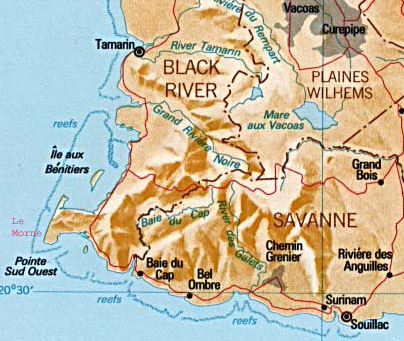 The launch is located at the extreme SW corner of the island. The "student" with the other man launch an unknown type and size of kite off the east side of the peninsula that contains Le Morne on the afternoon of May 12, 2005. A satellite view of the area with the launch near the arrow. Winds were quite strong estimated to range from 20 to 30 kts. side onshore and higher in rain squalls. The water is fairly shallow in this area with some coral heads. The "student" has a serious wipeout offshore and as he was using a board leash, he suffered a board impact to his head. The "student" returned to the beach in pain but fully conscious. He decided to sit down and watch the others kiteboard. The "student's" symptoms slowly worsen with time until he momentarily passed out about two hours later. He regained consciousness a few seconds later but he shortly after fell into a coma. He was taken for medical care after that. He reportedly died a few days later from a skull fracture and brain hemorrhaging. It was stated that if he immediately sought medical treatment after the impact he might not have died. The unofficial instructor may have been taken into custody by the authorities per one report. Further information has not been available. Subsequent accounts from an party on the island that was involved after the accident provided a slightly different story which was presented in the newspaper article as related in the above account. Further information regarding this account and confirmation of events is requested. 1. Kiteboard leashes have caused serious injury to riders in the past through leash propelled board impact and by holding the board between the rider and on coming waves. Board leashes have figured in two other fatalities and possibly a third in recent years. 2. Kiters should learn how to body drag upwind early on even before water starting to avoid using board leashes in most cases. Using a board leash solely for the sake of convenience is a poor practice. A helmet may or may not aid a board leash user as boards in the past have easily cut through helmets or gone around them. One fatality victim of a board leash impact was wearing a helmet. Helmets provide important protection for kiteboarders but may not be that effective in avoiding a board leash related injury. 3. Seek qualified, quality professional instruction in an effort to maximize the learning experience and minimize the hazards of the process. Ideas on selection of instructors appear Here and Here. 4. Select weather/water conditions and gear appropriate for your experience. Avoid squalls/storms. If you have little experience you will likely have no idea what is appropriate - seek qualilty professional instruction. 5. If you have any reason to suspect head or spinal cord injury, remain motionless until medical help arrives. Accident victims are not always that aware of these hazards. It is important the bystanders to try to help the victim from causing further injury to himself. Kiteboarding can be "dangerous easy." Like operating a car or airplane, the mechanics of manuvering can appear to be deceptively easy. Obviously there is a lot more to know and act upon in all three activities than simple "manuvering." Many kiteboarders have been injured by underestimating the power and potential hazards of traction kites. Seeking help from others is a natural step and may work out sometimes in learning the basic mechanics of the sport but perhaps not. It is likely that a quality instructor would not have exposed a student to such conditions complete with unstable squall weather. The "student" had no appreciation perhaps for the actual hazards involved. A quality professional instructor would have had a strong grasp on the hazards and would have conducted the training accordingly. A well intentioned but not professionally trained kiteboarder acting in the capacity of an instructor may not have had the knowledge or ability to effectively explain the hazards to the student. Seek quality professional instruction. Board leashes have a long history of kiteboarding injuries. Some riders have mistakenly concluded that if they wear a helmet they are OK using a board leash. Experience has shown that this is a mistaken belief. Static leashes are certainly hazardous however even reel leashes have had their share of penetrated and fractured skulls as well. Work on body dragging upwind early in your training. If you are in hypothermic waters or in areas with adverse currents you may have reduced options regarding leash use. Your risks of injury has gone up substantially as a result. Finally, in not using a leash you may lose a board someday. The cost of the replacement board should be less than medical expenses, lost time off work and the pain of recovery from a board impact. Be sure not to put others such as bathers at risk if you lose your board. Avoid riding in crowded areas. The victim of a head impact may not realize he is in danger. Seek qualified medical attention rather than trying to "tough it out." That choice may well have cost this man his life. If you witness a kiting accident where the kiter could have a suspected neck or spinal injury and is on land DO NOT MOVE HIM. Attempt to reassure and keep the victim motionless as well. Keep warm with a blanket and wait for a paramedic with a stretcher and proper skills to move him. If he is in the water of course he must be moved to prevent drowning but avoid excessive spinal movements to get to shore, then do as above. If it is you that is injured or the person is walking wounded and has pain in the spine or neck then seek proper medical examination in the first instance (at an ER). It would be best for any movement of the victim to be accomplished by paramedics if feasible. The victim may have suffered an Epidural Hematoma as a result of the head impact. This can be a slow potentially lethal injury that can evade detection by not only the victim but also by bystanders. Recovery prospects are often good with early treatment however. The victim may have a "lucid interval" in which he can convince bystanders that he is alright. As a side note, the writer had a similar experience some years back after a serious kiteboarding related head injury. He managed to convince two individuals who witnessed the 80 ft. lofting into a wooden fence that he was OK. He proceeded to stumble around for 4 to 5 hours presumably in an incoherent state pending transport to the ER and treatment. His use of a helmet was credited as saving his life by the attending neurologist. Diagnosis of an epidural hematoma can be evasive even in a medical setting, requiring a CAT scan. Considering possible outcomes absent proper care, it is best to tactfully compel head impact victims to seek proper medical attention. I was just going back through old write ups and noticed this one from over a dozen years ago. It dealt with a more subtle form of fatality, that is after the head trauma had occurred. I noticed it had over 32,000 hits, not sure why? There are good lessons in this unfortunate account but they same might be said about many of the writeup here. That is why they were written in the first place after all. Anyway, as this post seems to be of particular interest, I will bring it back to the top.